It’s 7 a.m., and you’re standing in a line for your favorite coffee. You love this coffee shop and every barista here knows your regular order, so it’s no wonder they start making the ‘short black’ without asking. “Why is my coffee bitter than ever? Does coffee go bad?”, you can’t help asking yourself. With your love for coffee, you can’t afford to drink espresso that tastes bad. Thus, you want to understand why your coffee tastes bitter. 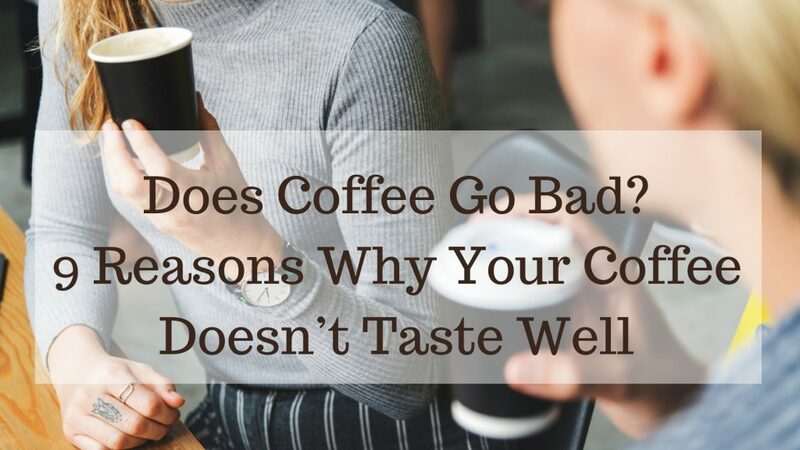 And this article is exactly what you need: read whether your coffee can go bad and understand top reasons why it may taste bitter. If you buy coffee from an outside location, it’s nearly impossible to influence the quality of coffee in your cup. But if you’re among 79% of people who still enjoy making coffee at home, you can learn a lot from this article and prevent brewing bad coffee. You buy low-quality coffee. When it comes to buying coffee beans, not only the taste plays a great role in making the purchase decision, but also the price. With a great variety of coffee brands on the market, it can be daunting to buy the right coffee beans that suit your taste and budget. However, when you opt for the price, you may sacrifice the quality, and therefore your coffee can taste bitter. Obviously, it can be difficult to choose quality coffee beans, so you can always rely on customers’ reviews online. The solution: do research and find a trustworthy coffee company to buy high-quality beans only. You brew stale coffee beans. Does brewed coffee go bad? Sure thing! And it goes bad even faster if you use stale coffee beans. Moreover, stale coffee beans affect the taste of your perfect morning coffee. Thus, it’s important to pay attention to the freshness of coffee beans you use to brew your coffee. While it’s easy to ensure coffee beans are fresh when you roast them at home, it’s more difficult when you buy coffee beans somewhere. The best way to avoid buying stale coffee beans is to find a reputable local grocer or coffee shop. The solution: refresh coffee beans with adding salt as it’s a proven way to reduce the bitter flavor. You use the wrong coffee roast level. Once you choose the coffee roast level that doesn’t suit your needs, you can get coffee that tastes bad for you. For example, if you don’t like burnt coffee taste, you’d better choose a lighter coffee roast level. The darker the roast, the bitter the coffee. Trying to roast coffee beans at home for the first time, get ready you won’t achieve the perfect roast level, and therefore the taste of your coffee may suffer. The solution: experiment with coffee roast levels to find the one that suits your preferences. You choose the wrong grind size. Although there are different grind sizes, most people use one of the top seven. Depending on the brewing method, you need to choose the best grind size. If your drink tastes salty, acidic, or sour, it may mean coffee beans are under-extracted. And if your coffee tastes bitter or hollow, it may mean coffee beans are over-extracted. Once you have found a perfect grind size that goes with your coffee gear, you’ll experience drinking perfect coffee at home. The solution: know the right grind size for your favorite brewing method. You utilize the wrong coffee-to-water ratio. 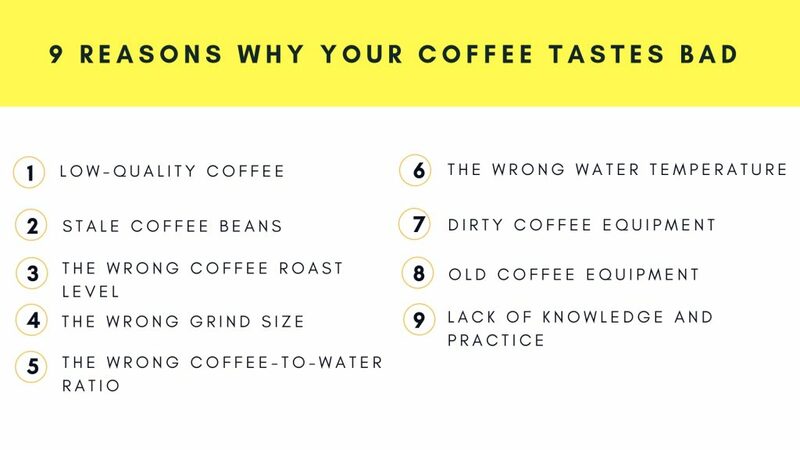 If you have been wondering “why is my coffee bitter”, the answer may be on the surface: you don’t know the right coffee-to-water ratio that suits your needs. Having little experience of brewing coffee at home, you’d better use the cup with lines or indicators measure the right amount of coffee and water. The solution: adjust the coffee-to-water ratio to meet your individual taste preferences. You boil water and it’s too hot. Although it seems easy to brew coffee at home, most people don’t know some nuances when it comes to using the right water temperature. For example, if water is too cold, your coffee can be under-extracted. And if water is too hot, it’s easy to destroy volatile oils and the subtler flavors. Thus, the right water temperature plays a key role in brewing tasty coffee. No matter what cup of coffee you choose, it’s recommended to use water at 205°F (96°C). The solution: don’t let the water boil and use the thermometer to check the temperature. Your coffee machine needs cleaning or descaling. For many of us, cleaning a coffee machine isn’t a must. When we brew coffee, we don’t think it’s important to clean the equipment often. However, dirty equipment contains oils from old beans that affect how new coffee tastes. Even if you use other brewing methods, you need to ensure your equipment is clean. Remember that taking proper care of your coffee equipment is a proven way to drink tasty coffee at home. The solution: keep your coffee equipment clean and descale your coffee machine from time to time. You need new coffee tools. You have been using your favorite coffee tools for many years, but now you mention bitter coffee taste more and more often. Although there might be different reasons for that, one of them is that you need new coffee tools. Just like any other thing, coffee equipment gets worse with time. Replacing old coffee tools, you can notice a boost in flavor. Thus, you’d better get new coffee tools before your coffee tastes bad (on average, it takes 1-3 years for a coffee tool to go worse). The solution: invest in high-quality coffee tools and take care of new items regularly. You lack theoretical knowledge and practice. Good coffee depends on coffee beans, water, equipment, and your brewing skills. Yes, brewing tasty coffee is an art that requires both knowledge and practice. Since all people are different, it’s important to learn your individual taste and understand how to brew coffee that meets your wants. The more you practice, the faster you can understand why your coffee tastes bad and how to fix it. The solution: watch educational videos online and practice to master coffee brewing skills. So, does coffee go bad? Yes! It can go bad with time or it can taste bad for a variety of the above-mentioned reasons. From choosing quality coffee brewing water to keeping your coffee equipment clean, every single detail matters and affects the taste of your coffee in the cup. Once you know possible reasons why your coffee tastes bad, it’s easier for you to start brewing tasty coffee at home and avoid making common coffee brewing mistakes. Can you now guess why your coffee tastes bad and how to fix it?